Long-rumored versions of HTC's ubiquitous Touch Diamond2 and Touch Pro2 have finally been made official for AT&T -- but perhaps more notably, they mark AT&T's very first forays into the WinMo 6.5 arena as Microsoft officially unleashes the latest version of its mobile platform on the world this week. The Pure (pictured left) is a particularly heavy rework of the Diamond2's industrial design, shedding the square metal-adorned shell for a glossy black plastic one while carrying over the 3.2-inch WVGA display and 5 megapixel autofocus camera. Meanwhile, the Tilt 2 resurrects the Tilt name -- dormant since AT&T's version of the TyTN II made way for the Fuze last year -- bringing a 3.6-inch WVGA display, full QWERTY keyboard with tilt-up display (hence the name), full duplex speakerphone, and a 3.2 megapixel cam. The Pure will be the first on shelves, available already (ahead of Microsoft's official release on Tuesday, interestingly) for $149.99 on contract after a $50 rebate; the Tilt2 comes "in the following weeks" for $299.99 after $50 rebate. 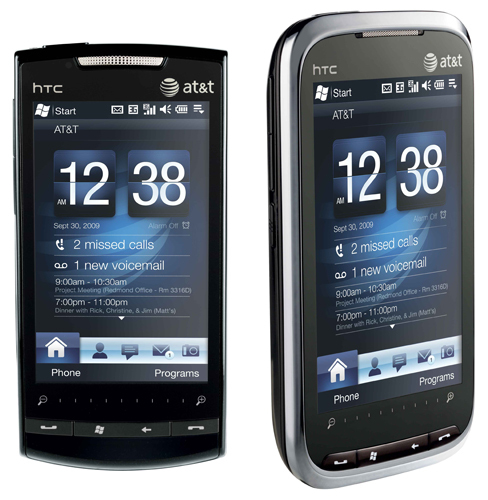 HTC Pure and Tilt 2 bring Windows Mobile 6.5 to AT&T originally appeared on Engadget Mobile on Mon, 05 Oct 2009 00:01:00 EST. Please see our terms for use of feeds.